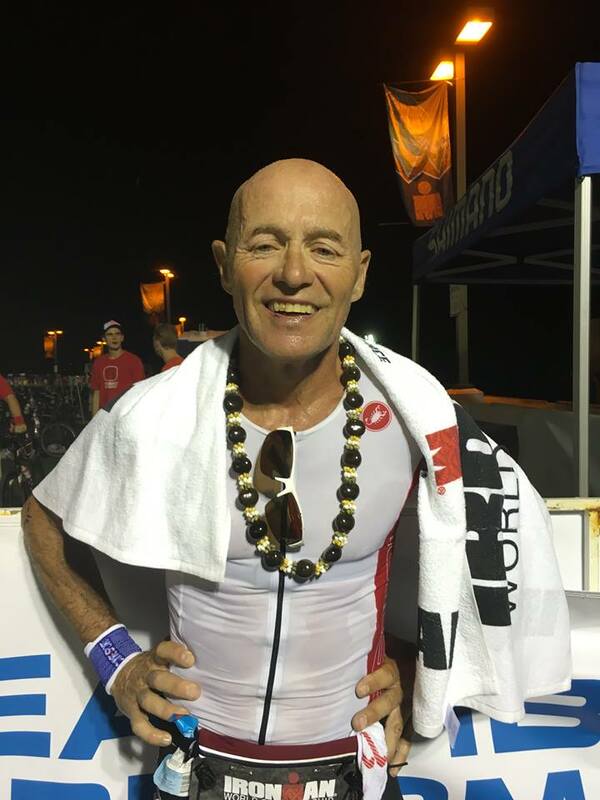 Roger Girard uses GUNA during IRONMAN | GUNA INC.
Kona 2016 is now an event of the past. This was my 7th participation at this World renown IRONMAN Championship event, my 22nd IRONMAN. As always, each time, it’d a self-discovery experience. What a place and what an experience. I have to say that I feel very privilege to be on the Big Island once more. We had arrived a good 10 days prior to the event in order to do volume workout and a taper week. Just 3 days prior to flying, I ran a ”120 km 6-person relay”, and personally completing 3 relays for 32 km. My left hamstring was very tight, so I used GUNA-Arthro/GUNA-Flam to help the recovery process back home and during the higher volume training. The first 3 days in Kona was dedicated to volume. Thursday: swim and 115 km bike. Friday: 2 hours and 15-minute run and 60 km bike. Saturday: swim, 90 km bike and 40-minute run. Sunday: Rest. Unfortunately, on Sunday, I develop a bit of a tight right calf. Next came taper week. From Monday – Friday, I significantly reduced my training load, while continuing taking GUNAMINO Formula Sport in the morning, Omeosport while training, and GUNA-Arthro/GUNA-Flam twice a day to help the small injury/soreness. By Friday, day before the IRONMAN, my body felt great. No soreness, good energy and good spirit. The day of the IRONMAN. We woke up at 3:45 a.m., took my usual breakfast of one bagel, peanut butter, a banana, juice, GUNAMINO Formula Sport and Omeosport. Time to rock and roll. Girard after finishing his 7th IRONMAN World Championship. Everything was going very well until the turnaround at 2 km. Being a slower swimmer, my weakest event, I started getting ‘run over’ by the ladies who started 15 minutes later then us. Oh boy, I felt every single female swimmer was doing 1 hour and 10 minutes or less. Finally, I got out of the water at 1 hour 26 minutes, a bit slow as I was hoping to do 1 hour 15 minutes-1 hour 20 minutes. I was 50th in my age group after the swim. We did not get much wind on the bike as some of my previous times. We were hit by wind for the last 30-40 km before arriving at Hawi (mid-point) and we got a cross wind for the last 40-50 km before returning to Kona. I had brought one water bottle with 30-40 pellets of Omeosport for the first portion, alternating with my electrolyte bottles. By 110 km, I started taking Omeosport (5 or so pellets at a time). I finished the 180 km bike segment in 6 hours 19 minutes. Again, slower than my 6-hour target, but was 38th in my age bracket. I started the run portion feeling pretty good. It’s not as if I had fresh legs, but it was OK. I stopped at each fueling station (every 1 – 1.5 miles) for 10 seconds or so to take in Gatorade, cola, water or gels. I finished my first capsule of Omeosport in the first 10 km and then opened up my second one. As usual, it’s hot in Kona. I completed my marathon in 4 hours 21 minutes, no cramps, pretty good legs, big smile (yes I do smile sometimes) and very pleased that I had once again got through Kona, the heat, the wind and the so strong competition. The overall time: 12h16’45, 30th out of 70 male 60-64, and 1655 out of 2300. Am I please with the result: I did my best considering all variables. It’s slower than expected. Maybe I was not hungry enough. Looking at my age group, I should have finished top 20, close to top 10. Easier said than done: did the best I could. Looking back, I did everything I could to get ready. My overall training program, went very well this year. I placed 2nd in my age group at IM Lake Placid (where I qualified for my spot in Kona), won my age group at 70.3 IM Timberman, 5th place at 70.3 IM Mont-Tremblant, and won my age group in all 4 events in my province in Canada. 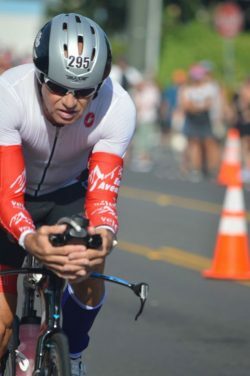 I can state without any reservation that Omeosport got me through every single event, at Kona and all competitions without cramps and with energy. GUNAMINO gives me the stamina and GUNA-Arthro/GUNA-Flam helps me out with recovery. Girard during the 180 km ride. Looking strong thanks to help help of GUNA products. As prior to the trip to Kona, I’m back on GUNA-Flu and Citomix to get my immune system back up. And more importantly, my recovery is very quick. I did 60 km on my bike yesterday (2 days after Kona) and will do 80-90 km tomorrow before flying back. If it was not for a blister under my left foot, I’d be running. When I was doing the 180 km bike leg on Saturday, I was telling myself, even though I’m registered for IM Florida, Panama City Beach in early November, I was going to end my 2016 tri season here in Kona. But, no, I feel great and I want to go to Florida and do better. And a major contributor to this decision is the GUNA products. It’s going to be cold at home, but I’m going to get back on training, give my spinning classes, coordinate the morning swim training, and continue my protocols with Omeosport, GUNAMINIO Formula Sport and GUNA-Arthro/GUNA-Flam. I’m not done yet. That’s it from Kona, Hawaii. Thanks GUNA Team for supporting me and being a significant part of what I do. Too bad you weren’t here this year. Farewell and God bless you. Roger G.